Stay connected with your customer's ongoing engaging conversations with our best social media management services in Delhi. We do all the basic things right from shopping to discovering relationships as the best social media marketing company in India, so that people are constantly engaged in your social media pages. Our SMM services are backed by our powerful market and insight-driven approach. We use the best marketing strategies to ensure that people are always engaged with your post and pages for our creative team uses a mix of strategies right from planning content, selecting creatives and designing the graphics. 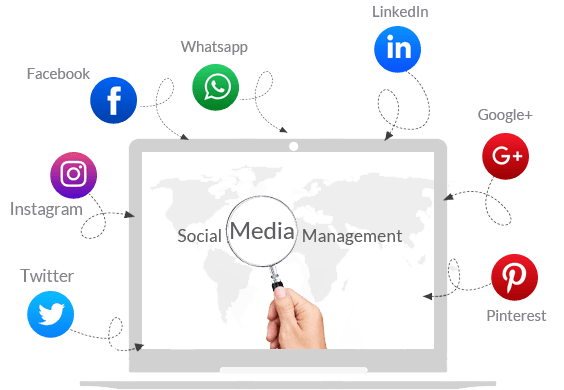 We provide the best social media management services in Delhi to make your business stay at par with others with our best social media creative team. Let us help you to get desired Social Media Presence to increase your Brand Awareness. We plan and create original content which is they of success mantra in social media campaigns/posts. We always create highly engaging content that your target audience could easily relate too or like to share. All these include videos, photos and, contests. We are an experienced social media agency in Delhi NCR which ensures that the promotions are done in both the ways either paid or organically. It includes budget planning, audience targeting and optimizing the campaigns to the desired results. From being prompt and quick in all the social media platforms. We ensure that the audience always engages with your posts and page. We provide customized engagement solutions in each and every platform and executing it effectively and efficiently. What are people saying about you in the online world? What are the macro trends? What are the voices and opinions that matter? How to respond on social media as per the need of the hour? We use the latest and best industry practices to ensure that you are always a step ahead in the online world and ready for changing horizons. With our data acquisition and management practices, along with analytical expertise plays an important in planning the campaigns and improving the ROI. After evaluation of facebook page and the audience, we ensure that represent your page and brand to the people globally, by regularly optimizing the post accordingly for the target audience to enhance the reach. Instagram is also one of the famous social media platforms, we help your business to grow from Instagram by using high-quality posts to target users across the platform. It plays a key role in developing brand visibility and awareness. Youtube is one of the common social media platforms for video promotions. With a strong video presence on this channel, it will help you to provide your brand with greater visibility and awareness. We also help in optimizing the videos for getting more viewers to the content. Twitter is a popular social media platform where celebrities post about their daily life but it can be of great use to promote their brands for the purpose of spreading brand awareness. We use this platform effectively for business growth and to connect with potential customers. Apart from the above mentioned platform, we can also help you to manage other social media platforms such as Snapchat, LinkedIn, Pinterest, or Google+ to grow your business. From finding the correct social media platform to create custom approaches for each platform, we will ensure the sucess for your brand. Once your social media strategy is out of our oven, the garnishing involves presenting it on platters to different target groups as per their taste buds (read interests). We ensure that each interaction is meaningful and relevant, thus impacting the business in a positive way and also contributing towards building the brand. Increase your Brand Visibility now ? Get the desired social media presence for your brand.